Look closely at taste buds on the tongue. Optional: use food colouring to show them more clearly. 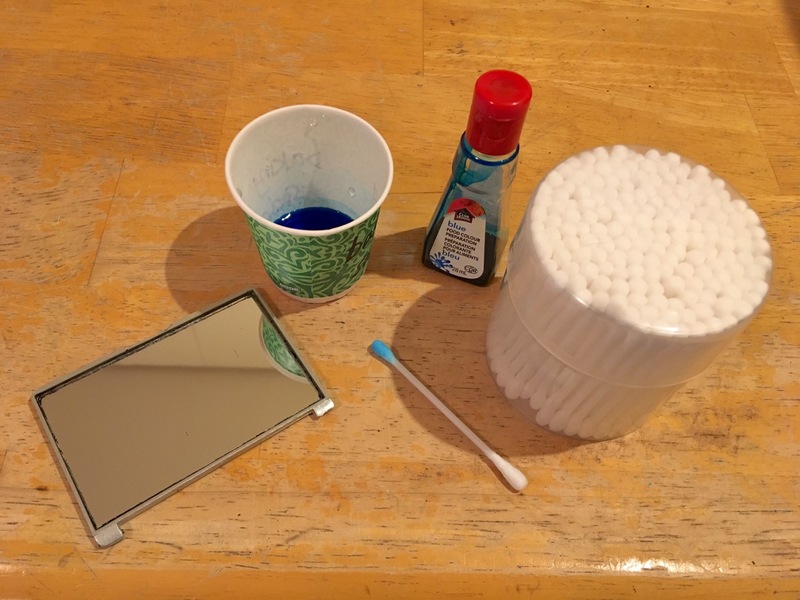 Students dip their Q-tip in the food dye and water, then paint the blue onto their tongue. Students can look at each others' tongues and use the mirror to look at their own. They may need to use a flashlight to see properly. They are looking for the pink bumps on the tongue, that do not stain blue. The blue dye will help contrast them with the surrounding tongue. The pink bumps are taste buds, which detect tastes. Cut squares of paper about the same size as a tongue, then use a hole punch to make a hole in it. Students lay the paper over each other's tongues, and count how many taste buds are inside the hole. Sweet detects sugar/protein when they bind. Sour detects hydrogen ions, when they enter the taste bud. Salt detects Na+, K+ or Li+ ions when they enter the taste bud. Bitter from molecules binding a receptor. Umami is glutamic acid binding a receptor. Taste buds, which contain the taste receptor cells, are distributed throughout the tongue, on the papillae. All the tastes are found all over the tongue. Image of the papillae on the tongue, which contain the taste buds at https://basicmedicalkey.com/wp-content/uploads/2016/05/F500414f28-04-978... 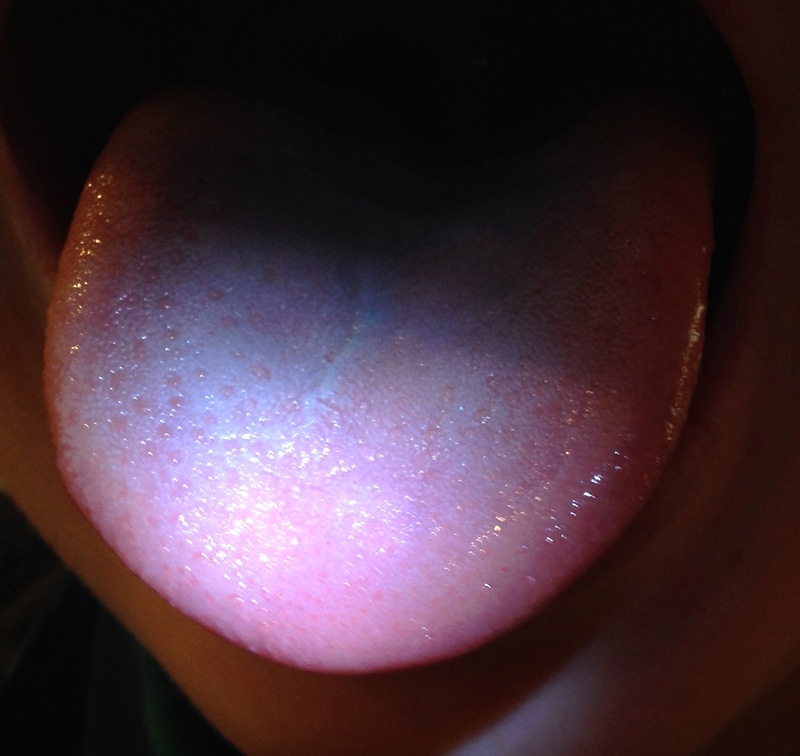 Taste buds are found on fungiform, foliate and circumvallate papillae, but not filiform papillae (which detect touch). Different students will have different densities of taste buds. Super tasters have the greatest density of taste buds, normal tasters have fewer and non-tasters have the least. To supertasters, foods may have much stronger flavors, which often leads to supertasters having very strong likes and dislikes for different foods. Supertasters often report that foods like broccoli, cabbage, spinach, grapefruit and coffee taste very bitter. The opposite of supertasters are non-tasters. Non-tasters have very few taste buds and, to them, most food may seem bland and unexciting. Food dye stain does not come off for an hour or two (similar to blue candy), so let parents know of activity.